Gosford Park meets Groundhog Day by way of Agatha Christie and Black Mirror - the most inventive story you’ll read this year. Get in your horse-drawn carriage and bunker down in your crumbling countryside home for this one, readers – you’re going to need all the time you can get for reading and contemplating your way through this one. Stuart Turton’s blistering debut novel opens as a doctor named Sebastian Bell is stumbling through the woods, shouting the name ‘Anna’ and finding himself in the middle of what seems to be a chase and a murder. Trouble is, he remembers nothing before that, not a thing, and, until someone explains it, he doesn’t even know his own name. It’s not even when he’s safely back in Blackheath, the superficially restored but dilapidated manor where he is currently residing, that things become clear. He knows then that he’s been invited to a party for one Evelyn Hardcastle, along with an extended group of other Terribly Important-Seeming People. He knows that violence has already struck the house. But soon he’ll find out that tonight, Evelyn Hardcastle will be murdered, and it’s up to him to figure out who did it – him and the seven other guests whose bodies will be hosted by one stubbornly willing but thoroughly confused Aiden Bishop, whose consciousness will pass back and forth between these guests over eight days, though he doesn’t know how or why. Bell is a doctor with a secret, but some of the other hosts will make him look like a jolly walk in the park. Because you can’t have a ball in a secluded country home without some damned bad sorts around the place. And those are just the people who aren’t out to kill him. 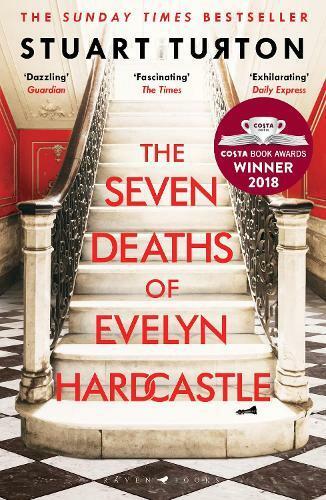 This was a glorious, mind-bending tome, a mystery and something like a time-travel paradox, if only Agatha Christie had decided to sink her teeth into one. The hosts and their varied personalities, trying their darnedest to crack through Aiden’s general control of them, make for eight different ways of looking at a day – methodically, fearfully, brazenly. Scenes that make no sense will become deliciously clear, everyone in that blasted house seems suspicious in some way, and the paid help will think themselves above their station and cause a ruckus. This is a stormy delight of a book – a storm you’ll gladly keep finding yourself caught in, over and over – and one to absolutely savour.